This blogburst piece is cross-posted today by more than 65 participating websites, to commemorate a milestone in Israel's history. A list of participating sites is at the end of the post. Today is the anniversary of the UN vote on Resolution 181, which approved the partition of the western part of Palestine into a predominately Jewish state and a predominately Arab state. The 33 countries that cast the “Yes” vote were: Australia, Belgium, Bolivia, Brazil, Byelorussia, Canada, Costa Rica, Czechoslovakia, Denmark, Dominican Republic, Ecuador, France, Guatemala, Haiti, Iceland, Liberia, Luxembourg, Netherlands, New Zealand, Nicaragua, Norway, Panama, Paraguay, Peru, Philippines, Poland, Sweden, Ukraine, Union of South Africa, USSR, USA, Uruguay, Venezuela. On November 30, 1947, the day following the vote, Arabs murdered six Jews in a bus making its way to Jerusalem, and proceeded to murder another Jew in the Tel-Aviv - Jaffa area. This was a prelude to a war that claimed the lives of 6,000 Jews, or 1% of the total Jewish population in 1948. This toll is the per capita equivalent of today’s Canada losing 300,000 lives, or the US losing 3,000,000. In addition, immediately after the UN vote, Arabs attacked their Jewish neighbours in a number of Arab countries, the murders in Syria’s Aleppo being the best known. I found I prayed a great deal in Iraq, usually at night when I was trying to go to sleep. Prayer, however, wasn't always a nighttime exercise. One afternoon in July, while walking down a sun-blistered street in Baghdad, I prayed a silent, open-eyed prayer. I prayed that there were no snipers in the buildings rising above both sides of the road. . . . That sunlit street had the feel of a Psalmist's shadowed Valley of Death. In nightly prayer, I thanked God for making it through another day. I thanked God for the men and women I served with. I prayed for my wife and children. I also prayed for the people of Iraq, particularly the children I'd see in the streets of Baghdad. . . . I wore a cross and a mezuzah on my dog tag chain. Bishop George Packard, the Episcopal bishop for the Armed Forces, gave me the St. George's cross when I visited him in his New York office last March. After he gave me the cross, he held my hand and offered an arresting prayer: He thanked God for giving me the opportunity to serve. He also prayed for safe passage and safe return. Two Texas neighbors gave me the mezuzah. Inside the mezuzah, on a miniature scroll, was the Hebrew "Traveler's Prayer" (tefillat haderech). "May it be Your will, Eternal one, Beloved of our ancestors, to lead in peace and direct our steps in peace, to guide us in peace to support us in peace and to bring us to our destination in life. "Deliver us from the hands of our enemy and lurking foe, and from robbers and wild beasts on the journey, and from all kinds of calamities that may come to and afflict the world, and bestow blessing upon all our actions. "Grant me grace, kindness and mercy in Your eyes and in the eyes of all who behold us. . . . Hear the voice of my prayer for You hear everyone's prayer. "Blessed are You Lord, who hears prayer."
. . . In his prayer, Bishop Packard compared a military tour to a dangerous journey. The Traveler's Prayer also recognizes the danger and terror as it asks God to guide us in peace. What a terrible paradox, but what a necessary prayer -- to ask for God's peaceful guidance in a world of war. It will be the greatest thanksgiving when all of our servicemen and women return, and all of us live in genuine peace. When they came to Delfs-Haven they found the ship and all things ready, and such of their friends as could not come with them followed after them, and sundry came from Amsterdam to see them shipt, and to take their leaves of them. One night was spent with little sleep with the most, but with friendly entertainment and Christian discourse, and other real expressions of true Christian love. The next day they went on board, and their friends with them, where truly doleful was the sight of that sad and mournful parting, to hear what sighs and sobs and prayers did sound amongst them; what tears did gush from every eye, and pithy speeches pierced each other's heart, that sundry of the Dutch strangers that stood on the Key as spectators could not refrain from tears. But the tide (which stays for no man) calling them away, that were thus loath to depart, their Reverend Pastor, falling down on his knees, and they all with him, with watery cheeks commended them with the most fervent prayers unto the Lord and His blessing; and then with mutual embraces and many tears they took their leaves one of another, which proved to be the last leave to many of them. How incredibly fortunate we are to be alive, living in this country, at this time, in abundance and freedom and safety unparalleled in history -- because of the sacrifices made 400 years ago, and today, in Iraq, by our forebearers and fellow citizens. Was Arafat the Obstacle to Peace? [N]ow that [Arafat] is dead the major obstacle to restarting the "road map" peace process has been removed. All it takes for a final resolution of the conflict is for the U.S. to compel Israel to show some "flexibility" and make some "concessions" to strengthen the "moderates" like newly elected PLO chairman Mahmoud Abbas. Yet what should be obvious is that even after Arafat rejected the best chance at such a solution -- the Camp David offer of 2000, which included 95% of the West Bank, joint possession of Jerusalem, and billions in cash -- he did not suffer any loss of prestige or position among the Palestinians for that lost opportunity to achieve what presumably they had wanted for so many years. . .
Only those in the West . . . could fail to see that Arafat's continuing prestige despite his failure to deliver a "homeland" was in fact based on something more important than a state: his commitment to the destruction of Israel. The obstacle wasn't Arafat but what Arafat embodied and expressed for the Palestinians: hatred of Israel and a passionate desire to make it disappear, a position he made clear whenever he spoke in Arabic. . .
Yasser Arafat's three top successors vowed on Tuesday to follow in his footsteps by refusing to compromise on the right of return for all refugees and insisting on the establishment of a Palestinian state on the entire West Bank and Gaza Strip, with Jerusalem as its capital. The three -- PLO Chairman Mahmoud Abbas, Prime Minister Ahmed Qurei and interim Palestinian Authority Chairman Rouhi Fattouh -- were speaking at a special session of the Palestinian Legislative Council in Ramallah to commemorate Arafat. “We will follow in the path of the late leader Yasser Arafat, and we will work toward fulfilling his dream,” Abbas told the council. “We promise you that our hearts will not rest until the right of return for our people is achieved and the tragedy of the refugees is ended.” . . . Addressing the session, Qurei said the Palestinians will follow in Arafat's footsteps by remaining committed to the right of return and the establishment of a Palestinian state. Notice the dual goals: the right of return and the establishment of a Palestinian state. Even Amos Oz knows that “right of return” is a code for the destruction of Israel. “Frankly, the Palestinian Authority, which is corrupt and cavorts with terror . . . is not the basis for a Palestinian state moving forward,” Rice told the Mercury News editorial board. "Without creating democratic institutions . . . there is not much hope for an eventual peace settlement with Israel," Rice said. “Everybody focuses too much on the personality. If you build the institutions and they are legitimate reformed institutions, they will serve the Palestinian people better . . .
“We don't think of this as reform of the Palestinian Authority,” said the president's top foreign-policy adviser. “We think of this as building the institutions of a state that will be capable of actually moving to statehood.” . . . This is precisely the theme of Natan Sharansky’s new book -- "The Case for Democracy" -- which Sharansky discussed with Bush and Rice on November 11 at the White House. As of yesterday, the book was No. 79 on the Amazon list of best sellers. It is definitely worth reading. The media has missed the full significance of some of the questions and answers in the joint press conference on the Middle East that George W. Bush and Tony Blair held last Friday -- in part because they missed the significance of something that occurred the night before. Minister without Portfolio Natan Sharansky met in the White House with Bush for over an hour Thursday discussing his new book, "The Case for Democracy: The Power of Freedom to Overcome Tyranny and Terror." According to Sharansky's office, Bush invited Sharansky and told him he had already read 210 of the book's 286 pages. Sharansky told Bush "Very few people in the world believe like you do in the ideal of democracy for all people. You are going against the flow, and are the world's dissident." A few hours before meeting Bush, Sharansky met with National Security Advisor Condoleezza Rice, who said that she too was reading his book, at Bush's recommendation. Harking back to the cold war, [Sharansky] recalls how the first President Bush rejected his advice to adopt a policy that would encourage [democratic] forces. . . that were leading to the breakup of the Soviet Union. Bush responded that such a policy would undermine Gorbachev and foment instability. . . . The need for stability, Sharansky concluded, is one of the most misused arguments in political life. “In its name,” he writes, “autocrats are embraced, dictators are coddled, and tyrants are courted.” . . .
Sharansky is especially critical of the Oslo Accords for creating an environment in which both Israeli leaders and outside powers conspired to ignore Arafat’s corruption and authoritarianism on the grounds that his leadership was essential to peace. . . .
[Sharansky] would like to see the goal of Palestinian democracy incorporated into the formal diplomatic stances of the United States and other parties involved in the peace negotiations. . . . It centers on a three-year period during which the outside world would collaborate to strengthen government and civil society among the Palestinians. After this period of institution-building, elections would be held and serious negotiations would begin toward a final peace settlement. . . .
[Q]. With Yasser Arafat's death, what specific steps can Israel take to revive peace negotiations? And do you believe that Israel should implement a freeze on West Bank settlement expansion? PRESIDENT BUSH: I believe that the responsibility for peace is going to rest with the Palestinian people's desire to build a democracy and Israel's willingness to help them build a democracy. I know we have a responsibility as free nations to set forth a strategy that will help the Palestinian people head toward democracy. I don't think there will ever be lasting peace until there is a free, truly democratic society in the Palestinian territories that becomes a state. And therefore, the responsibility rests with both the Palestinian people and the leadership which emerges, with the Israelis to help that democracy grow, and with the free world to put the strategy in place that will help the democracy grow. Six references in four sentences to democracy -- in response to a question about a settlement freeze. I intend to use the next four years to spend the capital of the United States on such a state. . . .There's no other way to have a lasting peace, in my judgment, unless we all work to help develop the institutions necessary for a [truly free] state to emerge: civil society, based upon justice, free speech, free elections, the right for people to express themselves freely. The first step of that is going to be the election of a new president, and my fervent hope is that the president embraces the notion of a democratic state. [W]hat the Prime Minister and I discussed last night is, do not we have an obligation to develop a strategy? And the answer is, absolutely, we have an obligation. . . . We are going to develop a strategy, so that once the elections [for a new Palestinian president] are over, we'll be able to say, here's how we will help you. If you want to be helped, here's what we're willing to do. If you choose not to be helped, if you decide you don't want a free, democratic society, there's nothing we can do. If you think you can have peace without democracy . . . I will be extremely doubtful that it will ever happen. PRIME MINISTER BLAIR: Yes, that's absolutely right. I mean, what we will do is anything that is necessary to make the strategy work. The important thing is that, first of all, there's got to be an agreement as to what a viable Palestinian state means. And what we're really saying this morning is that that viable state has to be a democratic state. . .
[T]he bottom line has got to be that if you want to secure Israel, and you want a viable Palestinian state, those are two states living side-by-side, and they are democratic states living side-by-side. And we've got the chance over the next few months with the election of a new Palestinian President to put the first marker down on that. The emphasis on a multi-year strategy of developing a democratic Palestinian society as a condition of a successful peace -- not on the familiar tactical bromides of a settlement freeze, or a new envoy, or more concessions by Israel -- and the further recognition that the election of a pro-democracy Palestinian president is simply the “first marker” in that multi-year process, is extraordinary. Compare the “free Palestine” movement with the “free Tibet” movement to illustrate the sheer campus brutality against Israel. Professors do not offer lunchtime lectures “objectively” explaining how terrible China is. There is no divestment from China campaign. There is no academic boycott of China. Casual anti-China brickbats aren't hurled out by professors in the Environmental Studies or Dramatic Arts departments. Even at Tibetan freedom concerts, rare would be the attendee that declared China a fundamentally illegitimate country and demanded its abolition. The calls to abandon our only ally in the Middle East and the foul apologies for terrorism are testaments to the intellectual corruption of the academy. Campus Watch monitors Middle East Studies departments on American campuses. Its reports on the University of California at Santa Barbara are here. In the end, it was farce. The person who pioneered terrorism into the scourge of the 21st century died a billionaire in Paris, kept clinically alive long enough for his “wife” and fellow “abus” to negotiate over the spoils. Fouad Ajami recognized that it was a credulous world that was the key to Arafat’s murderous career. The world indulged Yasser Arafat, gave him plenty of room to maneuver, showered him with aid and money, and graciously offered him a place of prominence in the great diplomatic game. (The oddest gift, given Arafat's . . . habitual resort to terror, was a Nobel Peace Prize . . .) . . .
[Arafat] took the money of the princes and monarchs of the Arabian Peninsula and the Persian Gulf -- but sided with Saddam Hussein when the order of princes came under attack in the first Gulf War. He took the "hospitality" of Jordan and Lebanon -- but scrupled not at all when it came to bringing ruin and bloodshed to those lands. He could forever hoodwink the Europeans, who were all too willing to believe the legend of his moderation. American diplomacy in the Clinton years, too, fell under Arafat's spell . . . It is idle to lament the historic opportunities wasted by this man. The fault lies not in a leader whose weaknesses were known the world over but in the illusions and the hopes invested in him by outsiders willing to be deluded. Only George W. Bush was not taken in. Bush ended the White House visits, declined a U.N. meeting and stopped the parade of “envoys” to Arafat’s door. Once Arafat lied to him about the Karine A, he was finished. Bush’s statement yesterday praised not Arafat’s life, but the hope his death creates. Arafat himself now moves on to Gehenna, the fire that shall never be quenched, leaving his people behind in the hell he created for them -- no closer to statehood than they were in 1948, or 1978, or 2000, able to achieve it now only if able to summon the strength to reject the path he took them down. The latter hell is at least reversible. So we may now hope for a better day for Israelis and Palestinians alike. 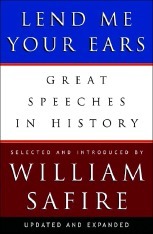 William Safire has a new edition of "Lend Me your Ears" (W.W. Norton & Co. 2004) -- his 1,000 page compendium of the “Great Speeches in History.” It belongs in every library. The volume starts with Pericles, who "Extols the Glory That is Greece at the Funeral of Its Fallen Sons" (“Those . . . have the greatest souls, who, most acutely sensible of the miseries of war and the sweets of peace, are not hence in the least deterred from facing danger”) -- a speech made more than 2,500 years ago. It ends with several undelivered speeches, including John F. Kennedy’s extraordinary speech prepared for delivery in Dallas on November 22, 1963 (“We in this country, in this generation, are -- by destiny rather than choice -- the watchmen on the walls of world freedom”). In between is remarkable speech after remarkable speech -- including many of special relevance to Jewish history: Menachem Begin’s speech on the eve of the formation of Israel, Rabbi Stephen S. Wise’s Tribute to Lincoln, Emile Zola’s defense of Dreyfus, Anatoly Shcharansky’s defiant address to his Soviet judges before his sentencing, Rabbi Louis Finkelstein’s sermon at the White House, Anwar el-Sadat’s speech to the Knesset, Yitzhak's Rabin's speech on the White House Lawn, and more. Do not begin by mining the gold in this book’s speeches for nuggets, sound bites, or slight nibbles. Instead, place yourself in the moments they were spoken, in the places where the orator stood, and then read them, silently or aloud, for their content. . . . [T]hey were spoken by mortals to move other mortals. It is a truly wonderful volume. Maureen Dowd wrote that Bush got re-elected by “dividing the country along fault lines of fear, intolerance, ignorance and religious rule.” She thinks “W. ran a jihad in America” -- by opposing abortion and gay marriage and “suffocating” stem cell research. Gary Wills wrote that Election Day was “The Day the Enlightenment Went Out.” He says we now resemble “our putative enemies” -- Al Qaeda and Saddam Hussein’s loyalists -- more than we resemble the enlightened “secular states of modern Europe." We are a country of "fundamentalist zeal, a rage at secularity, religious intolerance, fear of and hatred for modernity." Apparently our “religious energies” need to pass a global test. As someone who shares the views of Dowd, Wills and Friedman on gay marriage, abortion rights, and stem cell research, let me gently advise each of them as follows: get a grip. There is a real jihad going on. It is being fought against us by real enemies. They have already struck at Istanbul, Madrid, Jakarta, Beslan, Moscow, New Delhi, New York, Washington, D.C., Jerusalem, Tel Aviv, Saudi Arabia. They are currently engaged in genocide in Sudan. They have made barbaric beheadings and suicide bombings commonplace. They tried to decimate Los Angeles International Airport on January 1, 2000 (during the golden Clinton years, more than a year before George W. Bush took office). September 11 was their second attempt on the World Trade Center. And you think the enemy is George Bush? Or religious people in red states? Gay marriage, abortion rights and stem cell research are important, but disagreement and debate on these issues -- on which there is more than one possible point of view -- is not “divisive.” On the contrary, the ability to discuss these issues in a civil and respectful manner, between groups of widely different backgrounds, is what distinguishes America from the "enlightened" countries of Europe. I’m up to the late 30s, when the long knives come out. Jews are forbidden to drive, since this arrogantly presumes to profit from the labor of good Aryan workers. (Seriously). Jews must pay reparations. Jews must have their property assessed. Jews cannot use the library public rooms. And so forth. Every day a different decree; every day a different liberty removed. It’s remarkable, really -- people get up, have breakfast, get the mail, tend the garden; in this sense they are unmolested. But imagine if every day you were informed of something you could no longer do, even if you didn’t do it. At first you take comfort to things you can still do, but it soon becomes apparent that any liberties you still possess are ones they have not yet gotten around to confiscating. . . .
And the author of this book has seven years left to go. .
We’re still all over the map on a great many issues, as ever, and the desire for compromise is still a desire to settle the issue OUR way. At the end of the day the Line will be moved; it’s just a question of where it ends up. The “progressive” impulse questions everything; the conservative impulse wonders why we question what has worked for us before. What emerges from this dynamic satisfies neither, and fuels the next round of debate. I’d rather have that than 30 years of a static society that ends up so ossified and brittle it shatters into a thousand pieces. Because there’s always someone there with a dustpan, a broom, and a long loud speech about how the Jews wanted it to turn out this way because they control the Hefty Bag industry. You want comity? You want progress? Enough with the catastrophe rhetoric, then. Enough with the nonsense. Enough with the gasbag fantasies. Reading the Klemperer diaries make me realize again what real true perfidy looks like, and how those who view a Bush victory as “four more years of evil” are parading their petulant variety of moral idiocy for the approval of the claque. . . .
It’s a great and rare idea: one nation, under God, with liberty and justice for all. I think we can hammer out the particulars in a spirit of good will, eh? Or not. Our choice. The impact of the Vietnam war in this election is not the difference between someone who served in Vietnam and someone who served in the military at home. Much less is it about their relative attendance records or the underlying facts of their medals. Vietnam looms over this election as the conflict between two fundamentally different mindsets that emerged from that war -- a conflict still unresolved today. One mindset viewed the war as what Ronald Reagan called a "noble effort." The other opposed the war as the imperial overreach of an arrogant and immoral America. The war in Vietnam was begun by a Democratic Party that first pledged to bear any burden to insure the survival of freedom (there was no oil in Vietnam); then committed the American military to prevent a Communist takeover of that country; and then, once the war became a morass, went into opposition and ultimately abandoned the country. The "liberal hawks" of that time (such as Scoop Jackson) were replaced by the anti-war left (and its standard bearer George McGovern) -- a faction of the party still in control today and the decisive force in the Democratic presidential race this year, which nominated the personification of the Vietnam anti-war left: John Kerry. The echo of this history is eerily reflected in an article in yesterday’s ReasonOnline by Tim Cavanaugh ("Desertion in the Field: Twilight of the Liberal Hawks"). Cavanaugh reflects on the liberal hawks -- "Paul Berman, Thomas Friedman, Fred Kaplan, Kenneth Pollack, Fareed Zakaria, Jeff Jarvis, Andrew Sullivan, Michael Ignatieff, and many others [previously] arguing for the expenditure of American lives and treasure in Operation Iraqi Freedom:"
What unified the liberal hawks was that their support for the war was based unreservedly on what is popularly understood as the "neocon" vision, the prospect of exporting democracy to the Middle East through force of arms. According to the "forward strategy of freedom," a democratic Iraq with an emancipated citizenry would serve as an example and beacon to the Arab autocracies, empowering liberals in the region while undermining dictatorships; opening up avenues of freedom and self-expression for ordinary citizens in the Muslim world would in turn remove the impetus for terrorism. . . . These days, none of those luminaries can summon a kind word for the president who acted in accord with their own arguments. . . . Bush's former supporters channel what is now the overwhelming conventional wisdom that the administration . . . failed to provide a large enough force to run the country adequately. . . .
[But] if you took seriously the idea that the United States was liberating the people of Iraq, then the Rumsfeld doctrine of minimal force was the only one that made sense. If keeping Iraq on life support meant committing a vast occupying force indefinitely, then clearly Iraq wasn't a very good test case for the democratic experiment. . In the event, of course, Rumsfeld's "inadequate" force was sufficient to conquer Iraq in three weeks . . . The war has in many respects gone better than expected, both during the three weeks and thereafter. In September 2002, Charles Paul Freund catalogued the widespread predictions of "potentially disastrous consequences:"
Iraq could fall apart under pressure from Shi'ites in the south (where much of the oil is) or Kurds in the north. A region-wide conflict could develop, especially if Israel is attacked, that the U.S. might be unable to contain. . . .
[T]he U.S. could find itself mired in regional conflicts and problems . . ."
None of this happened, although other predicted problems did (rising oil prices, Islamic attempts at mass murder). Since Iraq hawks are fond of citing analogies from World War II, let me join in the fun. American Marines were slaughtered at Tarawa because the pre-invasion bombardment of the island was woefully deficient. Hundreds of American paratroopers were killed by American anti-aircraft fire during landings in Italy -- for that matter the entire campaign up the Italian boot was an obvious waste of time, resources, and lives that prevented the western Allies from getting seriously into the war until the middle of 1944. (If anybody deserved impeachment, it was Winston Churchill, whose imperial obsession with the Mediterranean "underbelly" led to disasters in both world wars.) In late 1944, Allied commanders failed to anticipate that the Germans would attack through Belgium despite their having done so in 1914 and 1940. Abuse and murder of prisoners, targeting of civilians, and indiscriminate bombing all were common. On any given week, World War II offered more fuckups and catastrophes than anything that has been seen in postwar Iraq. So is Iraq a noble, remarkably successful effort, one worth seeing through to its conclusion, because we should bear any burden and oppose any foe, and finish a task assigned to our generation, comparable to battles of the 45-year cold and hot war against Communism? Or is Iraq a quagmire, an immoral attempt to force our values on another country and culture, a vain (in both senses of the word) attempt to spread freedom to a culture different from our own, pursued at too great a cost in lives and money? At bottom, Mr. Kerry's objection to the war in Iraq and the anti-Bush animus he has tapped into have nothing to do with protecting our troops, conserving resources to go after terrorists elsewhere, or even making nice with Germany and France. "We found most people [in Vietnam] didn't know the difference between communism and democracy. They only wanted to work in rice paddies without helicopters strafing them." And he articulated a remarkably consistent view this year when he indicated democracy was optional in Iraq and perhaps imposing a strongman there was preferable. This has not been George W. Bush's position. First in Afghanistan and then in Iraq, he has fought two wars of liberation. To fight these wars Mr. Bush first had to believe in the greatness of this nation; before he could export it to places that have known little more than tyranny, he had to believe the fundamental American value of liberty for all was also a universal value. [T]his war is forcing a great re-examination in America. . . . Faced with the threat of international terrorism and a president willing to use both military force and American values to confront it . . . what's at stake in this election is whether we will continue to confront terrorism with liberty or conclude that freedom isn't universal after all. Late this evening we will likely know which way the American people have decided to go: to proceed with the war whose goals united the neocons and liberal hawks, or to retreat (with assistance from the UN and our anti-war "allies") from a conflict judged not worthy, and not worth it. The vote will end one generation’s war, and define the current generation’s history. The whole world is watching.